Headlines: There has been some great fishing over the last week. Some very welcome rain and snow early last week pushed up the levels of the Thredbo and Eucumbene River and fishing has been good although you need to be on the water early for best results. 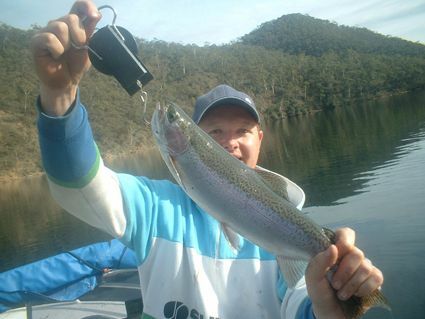 Lake Jindabyne has fished quite well and even with the lowering levels Lake Eucumbene is still producing fish. All rivers will be closed to fishing at midnight Monday the 11th of June. This weekend will be the last to get your river fishing fix till the rivers re-open again on the October long weekend. Rivers:- As mentioned the Thredbo and Eucumbene are really the pick of the rivers at present. There are plenty of opportunities to catch fish but a pre dawn start can be necessary. It does depend on the weather of the day but reports suggest that by 8.30am it can be all over. The fish are still there but move to the deeper sections or under sheltered banks or structure. With a bit of stealth and some careful searching you can still pick up a few fish. If you stand in the one spot flogging the water to foam you chances are greatly reduced. So go slow and search the water thoroughly. 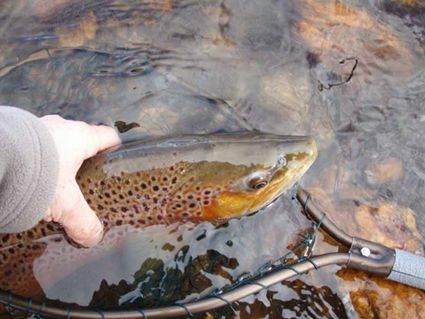 There have been numerous reports of good Browns (up to 8lb) and also a high percentage of Rainbows being caught in the lower Thredbo. Glo bugs and Nymphs are still the best flies to use and keep an eye on the strike indicator as some of the takes have been gentle of late. The upper reaches may be worth a look but all the better reports have come from the lower end. In the Eucumbene there have been perhaps less numbers but some big fish are still being seen. The river was flowing very well on the weekend and weighted flies are needed to get down in the deeper pools. The shallow riffles and runs are still worth a look with a lightly weighted Nymph or Glo Bug. Above the Portal has been generally cleaner water with the stretch from the Portal to Anglers Reach being quite dirty. 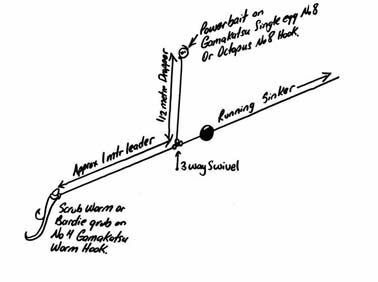 Remember that you are only allowed one fish and it must be over 50cm in length in both the Thredbo and Eucumbene and that these areas are artificial lure or fly only. 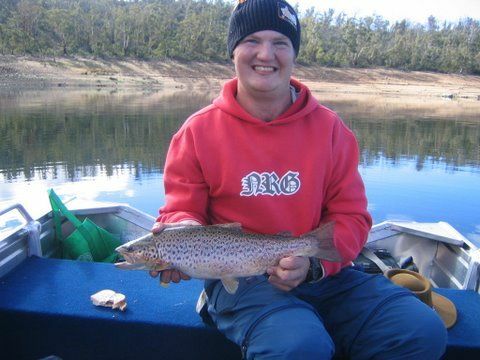 * David Jones from Sydney managed nine fish in the 30-50cm range from the Thredbo in one day of fishing. He caught both Browns and Rainbows with a small Glo Bug being the best fly. All fish were released. *Greg Beeton and Tim Stevenson fished the Murrumbidgee above Tantangara but found the going difficult so dropped back down to the Thredbo where Greg landed a Brown on a beadhead Woolly Bugger fished just on dark. Tim captured it on video and the fish was a very nice one indeed. They also reported seeing some nice fish. *Simon Langford from Canberra fished the Thredbo below the Bridge and hooked nine and landed five. Best fish was a 1.5kg Brown. He missed a few takes and said they were taking very gently. Glo Bugs and Hare and Copper Nymphs were the best flies. *Kieran O'Shannassy from Canberra fished the Eucumbene on Monday, during the middle of the day. He landed four fish around the 1kg mark on Black Beadhead Nymphs. He never polaroided a single fish, but did well searching the fast rippled water and runs at the head and tails of the pools. He said there were no other anglers on the Providence Flats at all. *Hi Tom, It was a cold day (around 9 Degrees C), overcast but fortunately no wind on the Eucumbene River today. The river has dropped about a foot since my trip up there on Friday but sufficient flow for the spawning browns. I was fortunate enough to catch and release a magnificent 3 1/2 lb brown which was a real rust colour. Although I have included two photographs, my photographer of the day failed miserable when I removed the fish from the water to get a picture of me holding the trout, he only set the focus and failed to take the picture: Never the less I had a great day on the river. Cheers Ian. 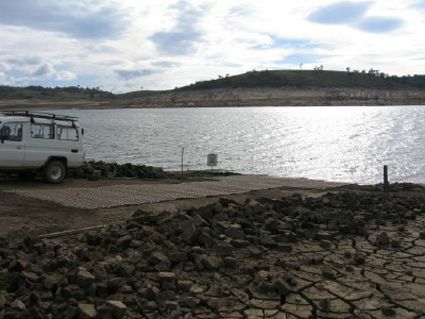 Lake Eucumbene:- Fly fishing in Eucumbene has been O.K and there are fish to be caught. The dam wall and Old Adaminaby areas still seem to be the best spots. Best flies will large wets and Streamers like the Mrs Simpson, Hammils Killer, Woolly Bugger, Fuzzy Wuzzy, Scotch Poacher and Craigs Night Time. Lake Jindabyne:- Some good reports from Jindabyne with an 3.8kg Brown being taken off the steeper bankd near town during the early afternoon. Well done Rick Sunderland on a great fish. On the whole the lake has fished better after dark and as in Eucumbene large Streamers have been the go. Creel Bay, Waste Point, Hatchery Bay and Kalkite have been good. 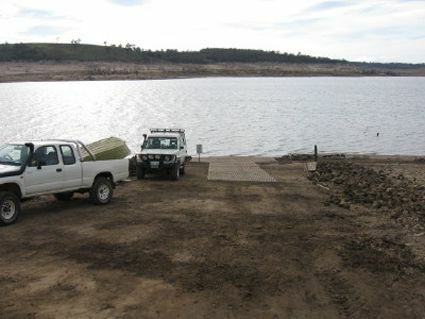 Lake Tantangara :- Reports of some fun fishing on small fish from the dam suggest that it is not a bad option at present. The water has come up since last week and being over some grass should have a few fish searching the edges for food, especially if it continues to rise. Fishing in Eucumbene has been good with trolling accounting for some reasonable catches. A vast array of different lures have been working but the old favourites of Yellow Wing Tassies/Cobras going well as are hot pinks, reds and orange colours. Three to four colours of lead core has been useful in some areas. Rainbow and Brown Trout Pattern Rapalas have been dynamite in the river mouth area but you do have to be on the water early for best results. Gold Scorpion 35's are working well and Rebel Deep Crawdads in the large size have knocked over a few this week. Spinning the river mouth with Jackals, Vibes and Soft Plastics is a great way to fish at the moment too. Loud, rattling vibrating lures fished in the slightly dirtier water will account for some good Browns this weekend. *Ninety Five Anglers from the Sydney Game Fishing Club fished the lake on the weekend. They managed to catch 90 odd fish to 1.3kg fishing from 20 boats. Most fish were in the 35cm bracket. *Damian and Matty from Camden trolled both Eucumbene and Jindabyne for seven fish on the weekend. All fish were taken on Tassies trolled on flat lines. Pink, Red and the Eucumbene Bomber were the best colours. *Above Byron from Jindabyne with a nice Brown spun up in the lake. He caught this and several others spinning with Jackall's. Looks like they bite best around lunch time. *David Jones from Sydney also had a quick trolling session after fishing the Thredbo River and caught three fish to 50cm on a Down rigged X4 Flatfish in Perch Scale. 15 - 25 ft was the best depth. *Mario from Adaminaby and his son Gino had a great two weeks fishing Jinde and Tantangara. They both caught some great fish with the best being an 11 pound Brown from Tantangara and an 8 pounder from Jindabyne along with a good number of smaller fish. Mario's own locally made and sold Snowy Minnow caught all the fish spinning off the bank. Talbingo:- The fishing at Talbingo has been great leading up to the cold season with great numbers of 2lb to 6lb rainbows been caught on a wide selection of lures, Tassie devils have been working exceptionally well early in the morning and late afternoon with double jointed rapalas working well down deep through the middle of the day. One angler that fished Talbingo for three days had landed 13 rainbows on cow bells and worms.All fish have been very aggressive when hitting lures and in excellent condition. Most of the fish ranging from 45cm &up. Report and Photo courtesy Ryan Payne.